Flywheel timing pin – BMW No.11 2 300. Camshaft alignment tool – BMW No.11 3 240/244. Timing chain pre-tensioning tool – BMW No.11 4 220. Tensioner locking tool – BMW No.11 3 292. Crankshaft pulley/hub puller (one-piece pulley) – No.11 8 190/200/210. Crankshaft pulley/hub puller (two-piece pulley) – No.11 2 150/410. Camshaft timing setting tool – BMW No.11 6 150. Camshaft sprockets alignment tool – BMW No.11 6 180. VANOS unit checking tool – BMW No.11 3 450. Turn crankshaft in normal direction of rotation (unless otherwise stated). If required: Mark position of crankshaft position (CKP) sensor before removal. Sump removal, if two-piece crankshaft pulley/damper is fitted. Engine at TDC No.1 cylinder. Ensure camshaft lobes are facing  . Ensure camshaft alignment tool can be fitted  . If not, adjust camshafts as follows:NOTE: Tensioner plunger is spring loaded. Pre-load timing chain with tool to 0,7 Nm  . Unscrew VANOS unit oil pressure pipe. Connect compressed air (2-8 bar) to VANOS unit. Use special tool. Turn crankshaft two turns until camshaft lobes face each other  . Insert flywheel timing pin  . Ensure camshaft alignment tool can be refitted  . Remove VANOS unit  .NOTE: Screws behind sealing caps have LH threads  . Depress secondary tensioner and lock with tool  . Remove intake and exhaust camshaft sprockets  &  complete with secondary chain. Remove camshaft sprocket and chain  . Fit exhaust camshaft sprocket with chain. Ensure arrow on sprocket aligned with upper edge of cylinder head  . Fit chain pre-tensioning tool  . Screw in adjusting screw until in contact with guide rail (DO NOT tighten screw). If necessary, realign camshaft sprocket  . Fit toothed sleeve  and toothed shaft with pin  to exhaust camshaft sprocket. Ensure tooth gaps aligned towards each other  . Push in toothed shaft until threaded holes positioned in centre of slots  . Align camshaft sprockets with secondary chain in position as shown  . Use special tool. During installation of camshaft sprockets, ensure tooth gaps on intake side aligned towards each other  . Fit toothed shaft with pin to intake camshaft sprocket. Push in toothed shaft until only 1 mm of spline is visible  . Fit washers and nuts  . DO NOT tighten. Fit plate spring with mark ‘F’ visible  and sensor gear  to exhaust camshaft. Ensure arrow on sensor gear aligned with upper edge of cylinder head  . DO NOT tighten nuts. Pull out toothed shaft on exhaust side as far as stop. Fit and release secondary tensioner  . Slightly pre-load plate spring by pressing on sensor gear  . Tighten nuts fingertight. 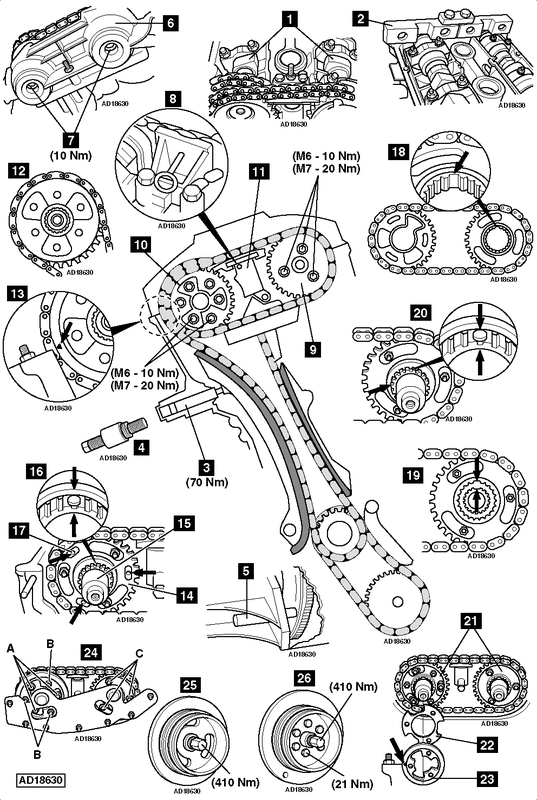 Set camshaft timing with tool as follows:NOTE: Remove gasket before fitting special tool No.11 6 150  . Second stage: ‘A’ – 20 Nm. ‘B’, ‘C’ – 10 Nm. Fit timing chain tensioner  . Remove alignment tools and turn crankshaft two turns. Ensure No.1 cylinder at TDC. Use special tools. Remove camshaft timing setting tool  . Fit VANOS unit  .NOTE: Screws behind sealing caps have LH threads  . Replace sealing caps. Tighten sealing caps to 50 Nm. Engine with one-piece crankshaft pulley/damper  . Engine with two-piece crankshaft pulley/damper  .